– Clean the screw, while hot, with a soft wire brush and copper or brass gauze and allow to cool to room temperature. If an oven is used to clean the screw, take care to avoid temperatures higher than 800°F. 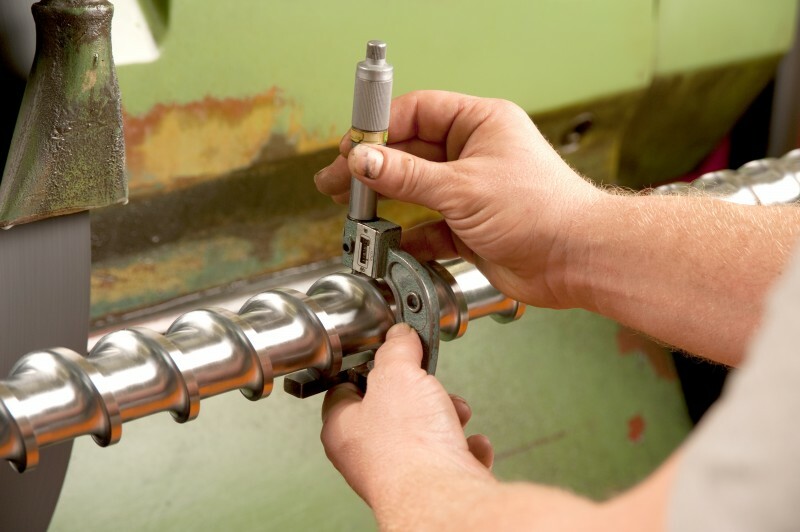 Higher temperatures, caused by an oven or the careless use of an acetylene torch, can cause screw warpage, chrome-plating degradation and surface blemishes. Remove any burrs observed after cleaning. – Measure the flight diameter every other flight with a flight micrometer. It is preferable to mark the flights and take two measurements at opposite axis at each mark. Record the results on a Screw Inspection Report. – Measure the diameter of the root between every other flight in the feed section and in the meter section with a micrometer or caliper and record the measurements. – Record the condition of the root for under-cuts or “washout” conditions. Examine the nose threads and shank for wear requiring repair. Note any cracks or chipped plating. Check the screw for straightness by rolling on a flat table or surface plate. – Clean the barrel ID, while hot, of any adhering plastic with a soft wire brush and copper or brass gauze and allow to cool to room temperature. – Set the dial bore gauge to the nominal bore diameter of the barrel using a micrometer. Take a gauge reading throughout the length of the barrel at 2 to 3 inch intervals and record the results on a Barrel Inspection Report. – Examine and note the condition of the feed hole area for heavily worn “washout” spots, and note other conditions requiring repair (cracks, gouges, bent condition, faulty end cap or nozzle adaptor) on the Report.